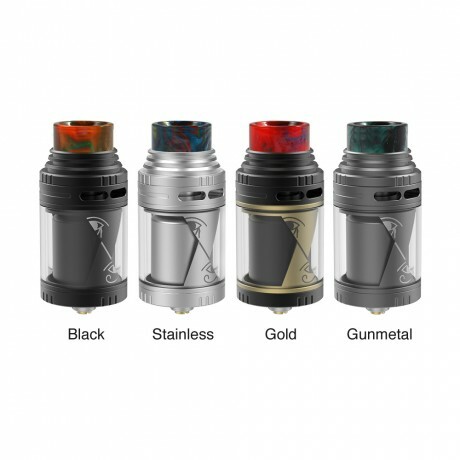 Inspired by the eye of Horus, Vapefly newly released an elegant and powerful RTA – Horus, which comes with 4ml ejuice capacity (TPD version with a silicon part added) and 25mm diameter. Horus RTA features a unique “b” airflow system, which makes airflow surrounding the coil to produce outstanding flavor and huge clouds. It adopts a 24K gold-plated single coil build deck for perfect electronic conductivity and easy building. Together with top airflow design and easy top filling system, it brings you a stable vaping without any leakage. Moreover, the resin drip tip and pierced designed top cap can effectively avoid the heat during vaping. 4 colors to select. Lost me at single coil, very sorry.